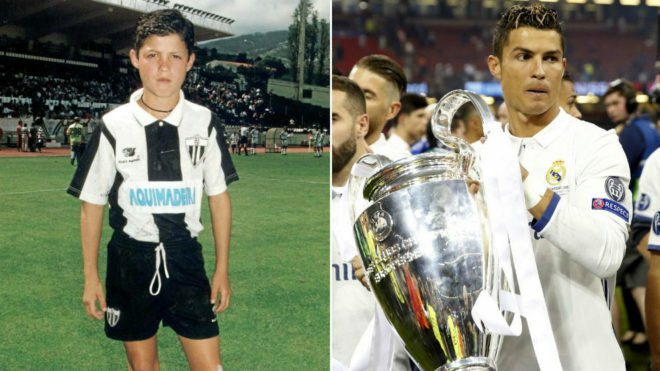 Many have been critical of Cristiano Ronaldo over the years, so much so that he has kept his history rather guarded, though on Monday the Portuguese goal-scorer penned an emotional letter about his childhood and how he started in football. Real Madrid‘s all-time leading scorer spared no detail in the document, discussing matters involving his late father and how these experiences helped shape his own view of fatherhood. The piece was created in conjunction with The Players’ Tribune. “My father was the kit-man at CF Andorinha, he kept encouraging me to go and play with the youth team,” he explained. “I knew this would make him proud so I went, I loved it and got hooked on the organisation and feeling of winning. Whilst he is more than comfortable now, a young Ronaldo would endure significant financial hardship as his family fought to make ends meet, the former Manchester United star recalling that he never received his own boots as a youngster. “It is true that we didn’t have much money at that time,” he continued. “Life in Madeira was not easy then, I used to play with old boots that I had inherited from my brother or I borrowed a pair of my cousins. It is quite incredible to see a footballer who has won almost every single trophy twice over remain so committed to hard work and success and the Portuguese international puts this down to something that was in him when he was born. “After 400 matches with Real Madrid, winning is still my highest ambition,” he noted. Ronaldo’s first breakthrough came in the Portuguese top flight when Sporting thrust him into the first-team as a teenager, and it was clear he was an outstanding talent. This process actually started years earlier, the veteran recalling a move to the club’s academy at the tender age of 11. “I was 11-years-old the day I moved from the island to Sporting’s academy,” he said. “It was the most difficult period of my life but I remember it so clearly. Los Blancos and Ronaldo seem like they have been a partnership for as long as anyone can remember but it’s only eight years since he arrived at the Estadio Santiago Bernabeu. Unprecedented levels of success and consistency have followed with the forward content with fulfilling his childhood dream of representing the famous Spanish club. “I had always admired Real Madrid and was ready for a new challenge,” he noted.